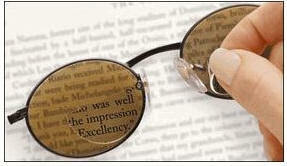 Stick-On Bifocals - Stick Bifocal Lenses on Any Glasses! Make Bifocals for Shooters, Reloaders, Fishermen, Sun Bathers, and Gunsmiths... Add close focus reading lenses to your glasses and see clearly up close!... They look and work like bifocals for a lot less money. And, you can even customize them to suit your special close focus needs perfectly! Need An Eye Test? Click Here! them wherever you want... even trim them to a special size or shape.Order Your Stick-On Bifocals Today! Turn any glasses into Reading Glasses. 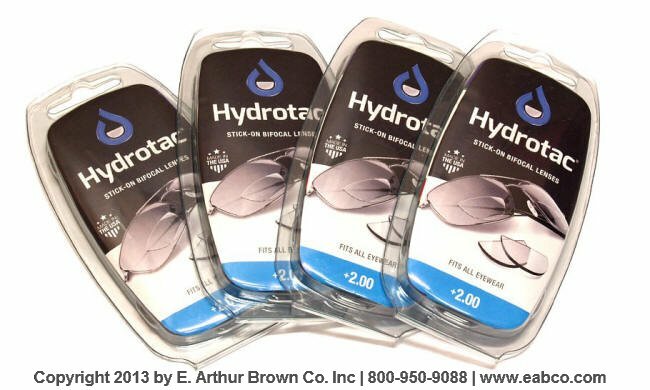 HydroTac™ Soft Reading Lenses adhere with water, yet are removable and reusable to provide optically correct magnification to sunglasses and prescription eyewear. Optx 20/20 Lenses are lightweight, ultra-thin pliable lenses available in +1.25, +1.50, +1.75, +2.00, +2.50 and +3.00 diopters. Soft Reading Lenses are a smart alternative to expensive prescription readers. A Little History by Eben Brown - I found Neoptx Stick-On bifocals shortly after I reached the age of needing bifocals for short distance reading. When we (EABCO) started selling them on the internet, the stick-on bifocal concept was not widely known nor popular. As Neoptix Stick-On Bifocals evolved into Optx 20/20 HydroTac Reading Lenses, they sold like hot cakes. A wonderful success story. Then about 3 years ago, Optx 20/20 lost it's production facility. They had to completely re-tool the whole Stick-On Bifocal manufacturing process. Optical precision is what they're all about... It took a lot longer than expected to get back up and running... But they're back! October 23, 2013 - At long last we got the word from Optx 20/20 that our HydroTac Stick-On Bifocals are coming out of the new production facility with quality and precision surpassing even the earlier production models. I have to congratulate Jeff and the staff at Optx 20/20 for hanging in there. For the past few YEARs we've been calling to ask, "When will you ship us more Stick-On Bifocals?" And they'd tell us about this or that set-back in their efforts to re-tool. Then earlier this year, they said they were close. By Summer they were proof testing and fine tuning the HydroTac production machinery. Congratulations Optx 20/20... The Stick-On Bifocal Lives! Coming Soon - The original Neoptx Stick-On Bifocals also came in a Dive-Optx version for placing a stick-on bifocal into a diving mask... Bifocals for Scuba and snorkel divers. The beauty of this is that a prescription glasses wearing diver can use daily wear contact lenses with any standard diving mask and put in the Dive-Optix Stick-On Bifocals for seeing up close at his gauges, dive computer, camera settings, etc. 1. Carefully wash the lenses of your glasses with an oil-free soap and allow them to dry. 2. Using warm water, place a drop of water inside the lenses of your glasses where you are going to apply the stick-on bifocal. 3. Take a stick-on bifocal lens and place it on the inside of your glasses lens, making sure the curve of the bifocal matches the curve of your glasses. You can position the stick-on bifocal anywhere on your eyeglass lens. However, they should be in the same respective position for both eyes. You can reposition the bifocal lenses as long as they are moist so, take the time to get them positioned where they are most comfortable and natural feeling and seeing. 4. Using a soft, lint free cloth, gently press the stick-on bifocals to squeeze out and air bubbles that may be between the bifocal and your eyeglass lens. Important: Wear your glasses the way you normally do, make sure your long distance vision is not obstructed by the stick-ons. If your line of vision is obstructed, remove the stick-on bifocals using your fingernail. Reposition the lenses as instructed above. Trim-To-Fit: If you need your stick-on bifocal lenses to be smaller, or if the bifocal over hangs the eyeglass lens when you have it in the best position, you can trim the bifocal along the bottom edge with a sharp scissors. Then re-install the stick-ons as per above. Allow to Set: While the stick-on bifocals are mounted to your glasses lenses, a molecular adhesion process takes place and in approximately 24 hours, will achieve their full sticking power. They will still be removable but will have their best holding power after 24 hours. 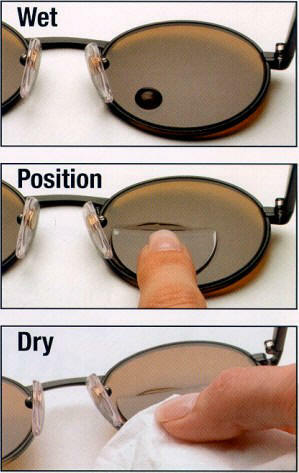 And if you DO decide to remove them from your glasses, they leave no glue or adhesive residue.